Received an interview invite from Arizona School of Dentistry and Oral Health this afternoon. What to do? What to do? What if I end up falling in love with that school? How would I be able to choose between USC and ASDOH? 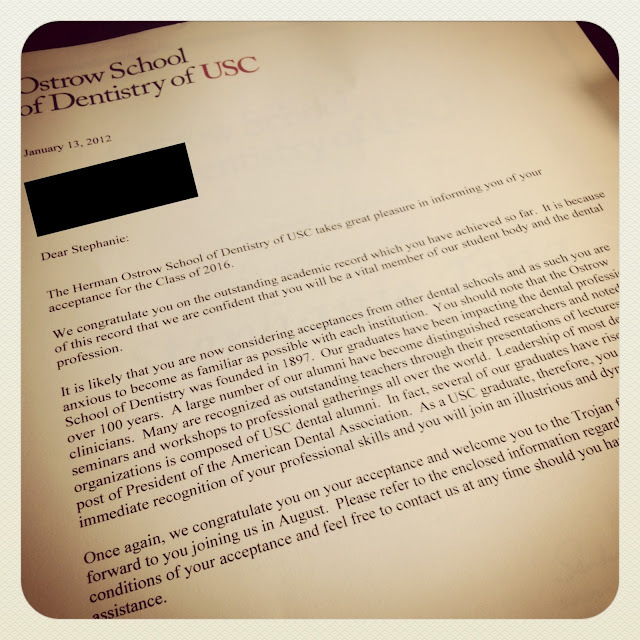 Life post-dental school acceptance is pretty sweet, I have to admit. So much of the pressures and expectations are suddenly lifted off your chest with one swift, fortuitous letter from the admissions committee. Make no mistake - I did work very hard to get into dental school. Although in my opinion, a portion of this dental school acceptance deal can be attributed to sheer luck. You know, simply striking the right chord with the right people at the right time? I've also already finished all of the prerequisite courses for dental school. I'm currently taking two courses to fulfill by kinesiology degree and one course for my public health minor. Senior year of undergraduate is a deja vu of senior year in high school. I received my acceptance packet from the University of Southern California, College of Letters, Arts, and Sciences around this time exactly four years ago. Now, it looks as though I'm going to be an eight year Trojan. Fight on! "You don't have to study! You just need to pass the class with a C or better so go out and have fun before dental school. Your exercise physiology course is useless for the purpose of dental school. Why are you working so hard still?!!!?!" "Get a grip Steph. You can't slack off this semester and party. It will reflect terribly on you as a student, as a person, and it will completely deface your undergraduate transcript." Apparently my "good Asian student" side is winning because I'm stuck in my room, working on lab reports, blogging, and studying on this fine Thursday night.